Which Machine Do I Need? A soothing and refreshing fine green tea with a zesty, natural, orange flavour. An exciting and invigorating herbal blend of pure peppermint leaves to help revitalise and renew. A delicate and calming herbal infusion to help relax and restore. Always store in a cool, dry place away from sunlight. 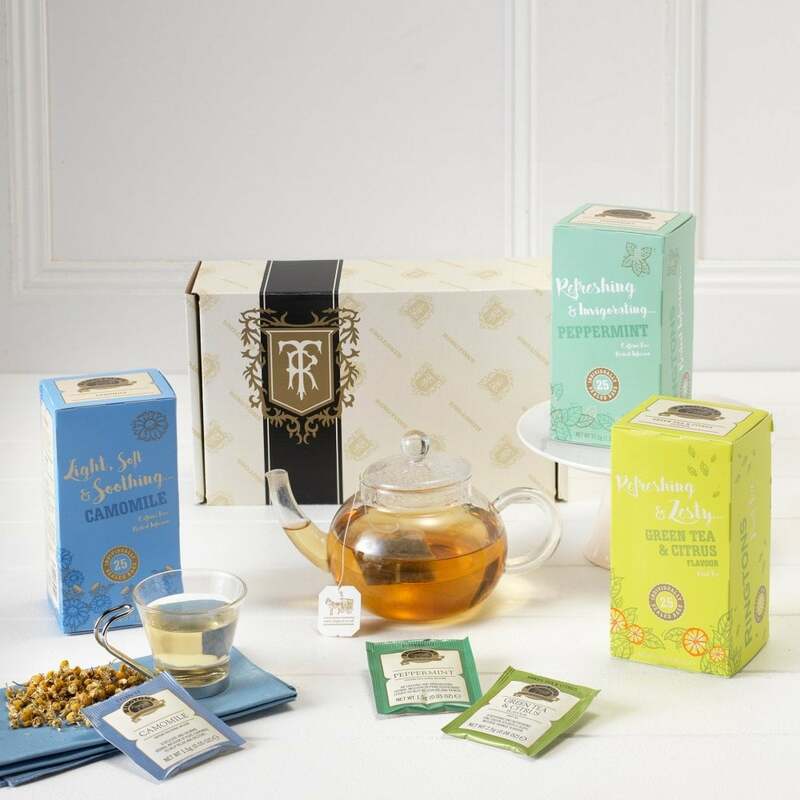 Ringtons Herbal Tea Gift Box contains Green Tea and Citrus Infusion x 25, Peppermint Infusion x 25 and Camomile Infusion x 25, presented in a classic gift box. Each tea bag is individually wrapped for freshness. At Ringtons we have been selecting speciality teas for our customers since 1907. Our tea-obsessed Tea Tasters travel the world to find the finest teas and we are proud to bring you our range which will delight tea-lovers of all kinds. We suggest the following preparation, brewing and preservation tips to help you fully enjoy your Ringtons infusion. Preparation - Use one tea bag per cup for the perfect Ringtons Infusion. Freshly drawn water (which has not been over-boiled) will bring out the finest flavours of our blends. Just boiled water is the ideal temperature. Brewing - All blends need time to properly infuse, releasing their true flavours. Infusions are best brewed for 1-3 mins. Ringtons Regular Order Service is available only on core products and not seasonal/limited edition items. Your Regular Ringtons order will be processed on your chosen payment dates and then delivered to you by courier via our Standard Delivery service. There is no extra cost or commitment to use this service, and you can cancel at any time, it is simply a way to save time and make sure you never run out of your favourite Ringtons products. Click here for more information on this service. FREE Standard Mainland UK Delivery on orders over £40.00 (1-2 working days once dispatched). Dispatch is normally 2-5 working days. Standard Mainland UK Delivery - £3.50 (1-2 working days once dispatched). Dispatch is normally 2-5 working days. Next Day Mainland UK Delivery - £6.95 (orders must be placed by 12pm). Parcels will be delivered Monday - Friday. Not available on Bank Holidays. Northern Ireland, Channel Islands, Scottish Highlands and Islands, Isle of Man Delivery - £7.95. Dispatch is normally 2-5 working days. Parcels will be delivered Monday - Friday. International Delivery – prices vary depending on the weight of your order and country you’re sending to. Cost of delivery will be calculated at the checkout. International deliveries may incur additional taxes and customs charges at the destination country, please check with the local tax authority before placing an order with us. Ringtons cannot be held liable for these charges. All orders are dispatched during normal office hours, please note we are closed over Christmas and Bank Holidays so orders will only be dispatched once the office reopens. Please see our Delivery & Returns policy for further information. © 2019 Ringtons Ltd. All Rights Reserved.